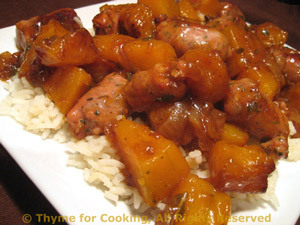 Sautéed Sausage, Butternut Squash over Basmati Rice, Thyme for Cooking gourmet menus. This could be considered a non-Asian stir-fry.... The technique is the same but without the Asian flavors- maybe more of a Caribbean influence. Whatever, it was quick and delicious for the end of the week. This should finish the butternut squash.